The next piece of our Born this way series is by Ági. Read the others' stories as well and find the series summary HERE. 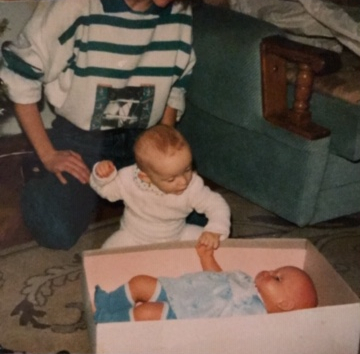 The picture was taken in 1991, I was one and a half years old and I got a doll (that at the time I thought was huge) for Christmas. I remember as an elementary schooler I used to pretend she was a real baby and I was her mum. I wasn’t too popular at school, but there was a boy who would always protect me when needed. So I thought he was going to be my husband when I grow up. He transferred to a different school, and for a couple of years I forgot about him. Then at the beginning of secondary our paths crossed again. Even then I believed he was going to be my husband, because it couldn’t be a coincidence that after all this time we met again. We even dated for a while, we could have been the typical perfect couple, but it didn’t work out. After a while I realised I would never find a perfect partner in a man. The time I spent trying to accept myself was hard. For 1-2 more years I still tried to be someone else, to surround myself with boys, hoping this feeling would go away – after all I had been dreaming about my wedding and becoming a mother one day all my life. More than 10 years ago society was less progressive in a lot of ways. Back then I often felt like my life was pointless, that I will never be happy, and I can never have a family. Today it’s a lot easier. I don’t feel like that anymore. Thankfully I got to be happy because I found a truly wonderful partner. On the other hand, my childhood dreams seem to be vanishing, because my partner doesn’t think we could live as an ordinary family. When I get sad, I think about how only the present matters – after all, back in the day I also saw things differently than I do now. I believe the future will sort itself out and we need to live for the moment. We must not let the uncertainty of the future sour our lives.